I know Vladimir Prelovac as a developer with intelligent ideas. Based on one such idea is the WordPress plugin named Insights. Insights is a research tool which lets you search your blog, images, videos, Wikipedia and Google while you compose a post. It employs an AJAX interface so search results show on the same page. The search results can be linked to keywords in your post; if they are from your own blog you can edit them too. The power of this tool is awesome – you can research on the subject while you compose the post, insert images, YouTube videos, link to the search results all fromthe same page. 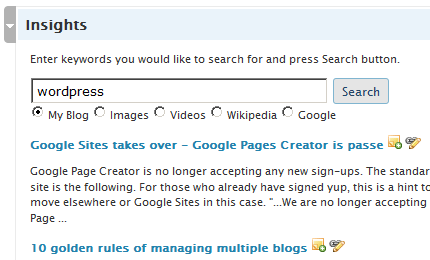 The Insight search box appears below the composition textarea in WordPress. Insights can be downloaded from Vladimir Prelovac’s site. How do you like it? Thanks for these nice wordpress plugins. I really enjoy getting them.